Bitter “Kas” soda is back in stock for the summer season. Never had bitter Kas before? Think of the classic Italian liqueur “Campari” taste without the alcohol. Try the bitter soda in a glass with ice and a squeeze of lime or slice of orange, for a refreshing not too sweet beverage. Make that refreshing drink a bit more adult with a nice pour of gin added to the mix. Perfect Bitter Kas cocktail recipe below. Squeeze 1/2 of lime or place one orange slice into each glass with ice. Next, pour in gin and then pour half of the soda bottle into each glass. Give the glass a quick stir and enjoy! 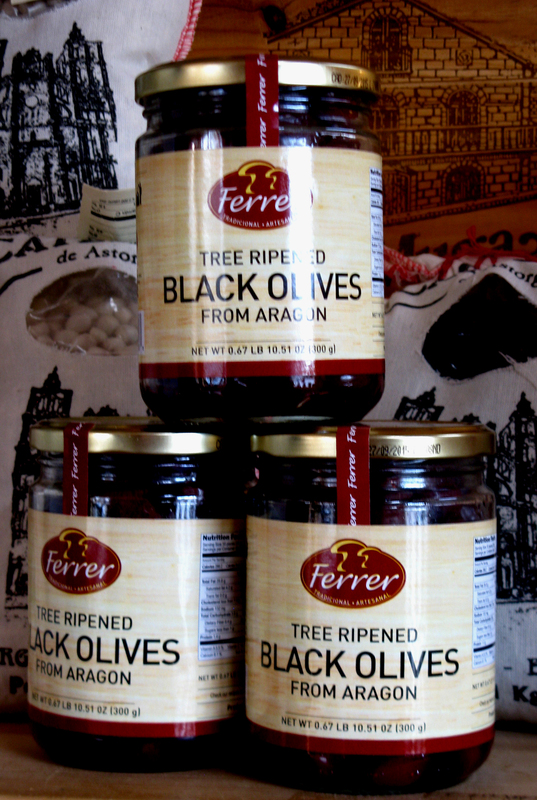 Tree ripened black olives from Aragon, Spain are a new product by the Ferrer brand here at TST. Each jar contains 300 grams of 100% Empeltre olives grown in Spain. Perfect as an instant tapa or an excellent addition to your next salad. Eating them straight out of the jar with a toothpick works excellent as well. Introducing two new, amazing sausages made with Iberico pork here at The Spanish Table in Santa Fe. Our cold case at the store made a dramatic upgrade the moment these tasty cured meats arrived. The traditional Fermin Spanish chorizo is made with salt, garlic, smoked paprika, and a hint of oregano. Beyond having a perfect balance of flavor, the texture is fantastic with the melt in your mouth fat that is typical of the pata negra pig. The second sausage we are offering is the Salchichon Iberico. The salchichon is a pork, beef blend seasoned with salt, pepper, and garlic. Simple seasoning of the salchichon gives the high quality of the meat a chance to shine. Both of these sausages are ready to slice and eat right out of the package. They would also make an excellent addition to a wide range of traditional or non-traditional Spanish dishes. New pattern from Le Souk Ceramique in our store. Our paella demo was a success! A big thank you to all of you who came out for our giant paella demo! It was fun to share paella tips and experiences with all of you. As you try out your pans at home, remember if you have a question you can always shoot us an e-mail or give us a call and we’ll do our best to answer your questions. 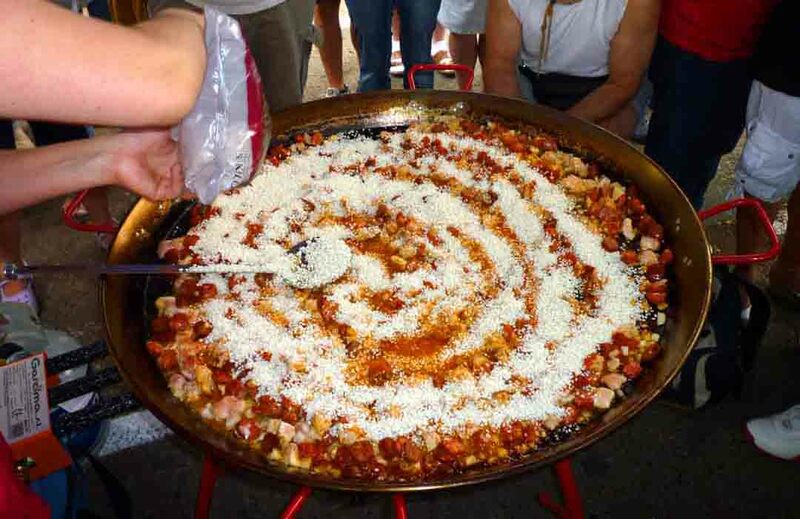 Giant Paella Demo This Saturday! I like to add my rice into the pan in a pattern that fits my mood that day. 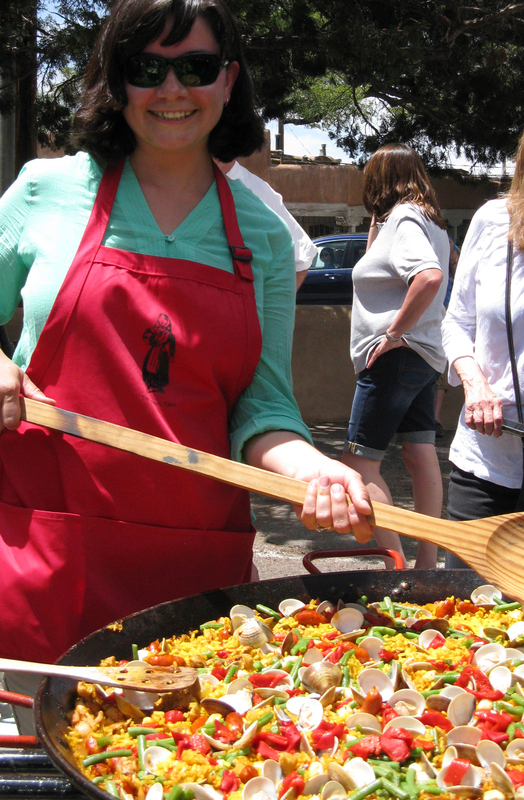 Here I was adding Arroz Bomba in a swirl at last year’s giant paella demo for Spanish Market. This Saturday, July 28th at noon we will cook a giant paella right outside our front door. So if you live in the Santa Fe area, be sure to mark it on your calendar. The event is free and lots of fun. It is a chance for us to celebrate our 10th anniversary of the opening of our Santa Fe location! So Happy Birthday to The Spanish Table Santa Fe! 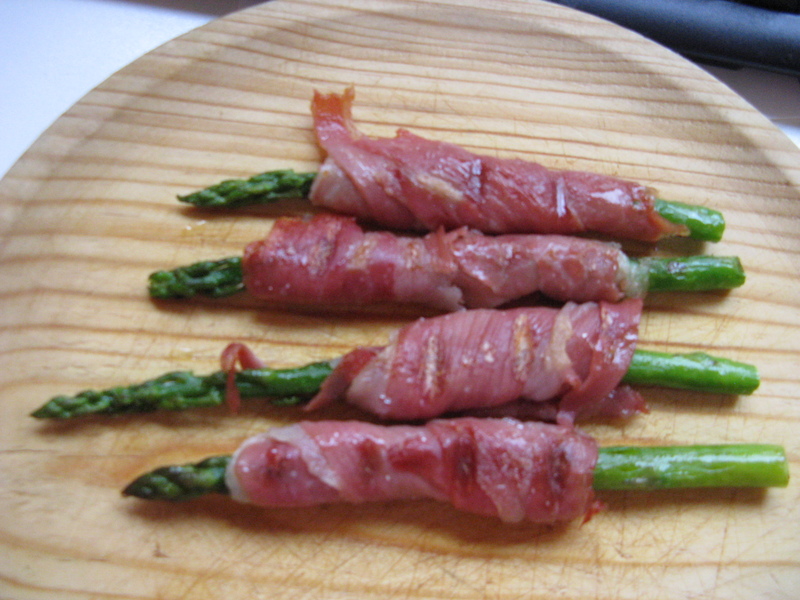 Jamon wrapped asparagus is so easy to prepare. Take half a bunch of asparagus, snap the woody ends off. Wash. Dry. Drizzle with olive oil, taking care to dip the paintbrush ends in. Now wrap with half a slice of jamon serrano per asparagus spear. Place on a little grill such as a Foreman Grill for approximately 4 minutes, or until grill marks appear and the asparagus spear is tender. Cool for 1 minute. Serve. Guests can pick them up to eat whole, or you can slice them with a sharp knife and toss with a vinaigrette made with sherry vinegar. Jamon Serrano from The Spanish Table, 8 oz. sliced, $17.99. Sandy Baker on Mexican Paella?